The Panasonic AG-HVX200 is the first camcorder featuring the P2 (professional plug-in) card. It meets the demands of the professional HDTV photographer with a compact and feature packed acquisition tool. Three interrelated features differentiate the HVX200 from every other camcorder in its price class: its trio of 16:9 one-megapixel CCDs for recording 1080p HD to SD and everything in between, variable frame-rate shooting from 12fps to 60fps in 720p mode, and its ability to record on P2 flash media as well as tape. Whether you record 60i, 30p, or 24p, it stores the video as 60i. So the camcorder stores a frame of 30p video split over two fields and translates a frame of 24p video to 60i via one of two pull-down patterns (called 24p or 24p advanced). I have been shooting some MXF footages using the HVX200 at 1080i 24pA for various output purposes. I do have problem with the pulldown and deinterlace of the 1080i 24P MXF materials. When I use log and transfer to import these MXF files into FCP 7, the MXF footage have some bad interlacing though I try everything to remove the pulldown and deinterlaces. Finally, I have to Google it to find out whether is a workaround of going from 1080i 24p MXF footage to a true progressive 24p. 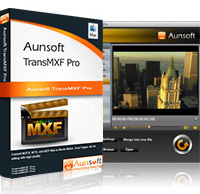 Luckily, I got Aunsoft TransMXF Pro for Mac, an excellent MXF to FCP converter that can convert and simultaneously deinterlace1080i 24P MXF to ProRes MOV on the latest Marvericks 10.9.1. What's more, this powerful MXF to FCP Converter is really a master to preserve and separate multiple audio tracks in MXF file, which can convert MXF to multiple audio tracks ProRes 422, ProRes 422 Proxy, ProRes 422 LT, ProRes 422 HQ, ProRes 4444 for FCP 6/7/X. Here I would like to share the brief workflow to transcode/deinterlace Panasonic HVX200 1080i 24P MXF to ProRes MOV for FCP on Marvericks 10.9.1. Click "format" and under the FCP menu, ProRes 422, ProRes 422 Proxy, ProRes 422 LT, ProRes 422 HQ, ProRes 4444 are all options for FCP editing. You can also enter FCP in the search bar directly. In most circumstances, 422 HQ MOV is recommended for high video quality. If you are planning to do heavy grading or VFX work from the ProRes, converting HVX200 1080i 24P MXF to ProRes 4444 is desirable. If your files size is at SD levels, you are advised to choose Final Cut Pro>Apple ProRes 422(Proxy)(*mov), which is recommended for 480i/p and 576i/p shootings as well. Click "Editor" button and then click "Effect". Tick the checkbox of "Deinterlacing" to deinterlace HVX200 1080i MXF files to ProRes before converting. In this way, the ProRes MOV generated from raw MXF files will be viewed flawlessly in FCP. 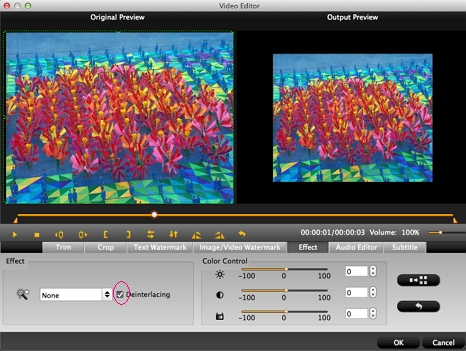 Here you are allowed to crop unwanted video parts, trim video length and add some special effects. 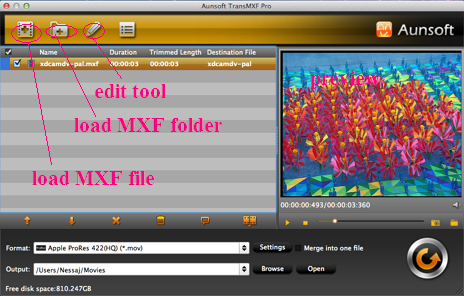 You can preview the raw MXF and output MOV videos simultaneously here. You can also customize video and audio profile of output MOV via click "settings" in the main interface to reset video bitrates, video frame rate, video size, audio channels, etc. You can preserve the video frame rate as 24fps, video size as 1920*1080 for editing in Final Cut Pro. Click "Start Conversion" icon, The HVX200 MXF to FCP Converter will convert MXF to ProRes MOV for FCP. After MXF to FCP conversion, you will be able to get the output files via clicking on "Open" button and then view and play converted HVX200 MXF in FCP without bad interlacing. Meanwhile, TransMXF Pro for Mac has the capability to convert/transcode/rewrap MXF file to multiple audio tracks with MOV, MKV, MP4, as well as tons of common output video formats, such as MKV, FLV, WMV, AVI, MPEG, etc, which ever expand the MXF applied range.